It took me a few months to decide between an iPhone and an Android. Finally decided on the Samsung Galaxy III--bigger screen, better photos. I am lacking the coolness factor of an iPhone though. I am loving Instagram. It's great to be able to catch little glimpses of our everyday life to hold on to, treasure, and share so easily. Here are just a few of my favorite photos I took recently. 1. Look Mom! I love you. 3. Outside my office window. We've had so much snow and it's been SO cold--record lows. 4. I bought a box of dinosaurs for grandson, Karson, at the Children's Museum in SLC. He carried them everywhere. I miss him. 5. 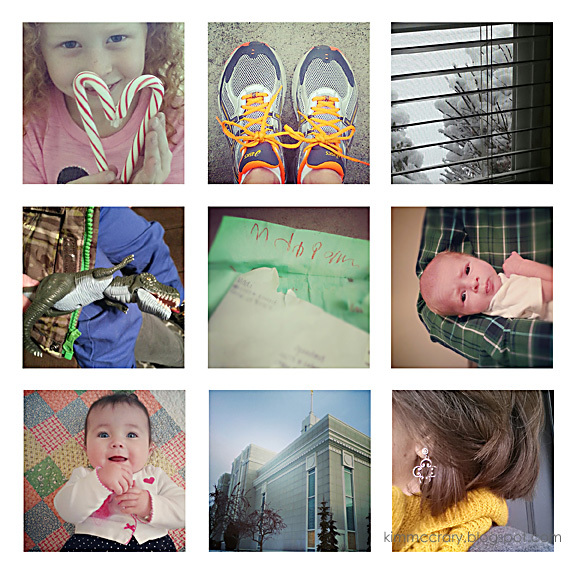 Madi Mail: a letter from granddaughter, Madilyn. It was all glued together and crumpled up. Best mail ever. I love it. 7. My granddaughter Piper, on the day she was sealed to my stepson, Josh and his wife, Tayler. She stayed with us while Mommy and Daddy got ready, then we took her to the temple with us. Oh, how we love her. 8. Mount Timpanogos Temple. Another McCrary family sealed together forever. I can't put into words how special it was to witness such a wonderful ordinance and how grateful we were to be there. Love them so much. 9. My fave earrings (Brighton), and I still love gray and mustard/yellow together.